Pūjyāpāda Śrīdhara Gosvāmī Mahārāja commenced his manifest pastimesat an auspicious moment on the ninth day of the fortnight of the new moon in the month of Kārtika, Saturday 10 October, 1895, in the village of Hāpāniyā in Kālnā, Bardhamāna, West Bengal. When he appeared, he accepted the foremost scholar Śrīyukta Upendra Candra Bhaṭtācārya Vidyāratna Mahodaya as his father and Śrīmatī Gaurī-devī as his mother. Both of his parents were devoutly religious and noble individuals dedicated to the Lord, and they gave their jewel-like son the name Śrī Rāmendra-sundara Bhaṭṭācārya. Later, beginning in 1923, Śrī Rāmendra-sundara Bhaṭṭācārya became attracted by the grace of the most worshipful Śrī Śrīla Prabhupāda and began visiting the Gauḍīya Maṭha, located at No. 1 Ultadaṅgā Road in Kolkata, to take advantage of the good fortune of hearing hari-kathā from his lotus mouth and pursuing the true purpose of human life. 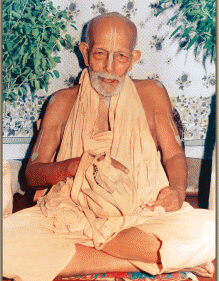 He listened to Prabhupāda’s discourses with rapt attention. Before long, he offered his full participation to the above-mentioned Śrī Gauḍīya Maṭha establishment in December of 1926 and became a recipient of Śrī Śrīla Prabhupāda’s special affection. In the month of Vaiśākha (April), Śrī Rāmendra-sundara Bhaṭṭācārya received initiation into the chanting of śrī harināma mahā-mantra from Śrīla Prabhupāda, and on the twenty-sixth day of Śrāvaṇa (August), he was awarded mantra-dikṣā according to pāñcarātrika conventions. His initiated name was Śrī Rāmānanda dāsa. Very soon after, in the year of 1930, Śrīla Prabhupāda—noting Śrī Rāmānanda dāsa’s exclusive dedication to the practices of bhajana on which he had been instructed, his genuine attachment to the service of śrī guru and Vaiṣṇavas, and his exceptional expertise in delivering the truths of scriptures according to Śrīla Prabhupāda’s current of thought—granted him tridaṇḍa-sannyāsa and gave him the name Śrīmad Bhakti Rakṣaka Śrīdhara, whichmeans ‘the guardian of devotion and the emissary of its beauty.’ Śrīla Mahārāja has truly fulfilled the meaning of this name, and thus, by the blessings of śrīguru, has become revered worldwide. All virtues befitting a Vaiṣṇava were resplendent in him. By the grace of śrīguru, one obtains the grace of the Lord and, additionally, all the demigodsalong with their virtues take up residence in one who is exclusively devoted to the Lord. Although he was born in an aristocratic brāhmaṇa family with ample luxuries, erudition and physical beauty, we never saw him display any sort of arrogance in the maṭha regarding his birth or learning. The calm and composed manner in which he somberly refuted, before vast assemblies of scholars, the misconceptions opposing devotional scriptures was exceptional, as was his ability to then establish the proper conceptions. As a result of hearing pūjyapāda Śrīdhara Mahārāja’s unparalleled and analytic sermons on devotional scriptures, such as Bhagavad-gītā and Śrīmad-Bhāgavatam, many earnest and pious members of affluent society attained thefortune of succeeding in life’s true purpose by taking shelter of Śrīla Prabhupāda’s lotus feet. Each and every one of his discourses was like a thesis. Anyone could have easily earned a doctorate degree simply by studying the notes of his classes. As referenced in the Garuḍa Purāṇa, Śrīmad-Bhāgavatam is the commentary of brahma-gāyatrī, the mother of all the Vedas. In accordance with the verdict of Śrīmad-Bhāgavatam, pūjyapāda Śrīdhara Mahārāja explained brahma-gāyatrī as a meditation on the lotus feet of Śrī Rādhā—śrīrādhā-padaṁ dhīmahi. The unprecedented elegance of this explanation is revered throughout the community of refined scholars who are adept at transcendental sentiments (rasa). In Śrīmad Bhāgavatam (10.30.28), [while searching for Kṛṣṇa, the gopīs state,] “anayārādhito nūnaṁ—this fortunate maiden has surely worshipped (ārādhita) [Bhagavān Hari].” Since She is acclaimed as having truly worshipped Kṛṣṇa, which means He finds bliss in Her, can there be any way to attain the lotus feet of Śrī Kṛṣṇa other than taking shelter exclusively of svarūpa-śakti, this intrinsic potency of His, which is the personified potency of bliss (hlādinī)? This in itself is the amorous worship devised by the maidens of Vraja—vraja-vadhu-vargena yaḥ kalpita. If your mind does not incline towards the worship of Rādhā, your worship of Kṛṣṇa has been in vain. This alone is the instruction of śrī gurupāda-padma, who is eminent among the followers of Śrī Svarūpa-dāmodara Gosvāmī and Śrīla Rūpa Gosvāmīpāda. Reciting this instruction as if it were a mantra causes the witch of illusion to flee. Bhagavad-gītā (10.10) states “dadāmi buddhi-yogaṁ taṁ yena mām upayānti te—I grant them the true intelligence and understanding by which theycan attain Me.” This statement refers to pure, determined intelligence aimed at attaining the eternal service of Śrī Bhagavān, for which one must pray to Gāyatrī-devi, the mother of the Vedas. This explanation manifested in pūjyapāda Mahārāja’s heart by the mercy of Śrī Rādhā’s eternal associate, his śrī guru, who identified himself as Śrī Vārṣabhānavī-dayita dāsa, the servant ofthe beloved of Śrī Vṛṣabhānu’s daughter. The true intent of brahma-gāyatrī is to meditate on the lotus feet of Śrī Rādha—śrī rādhā-padaṁ dhīmahi. It is only when one adheres to this understanding that the lotus feet of Śrī Rādhānātha, the master of Śrī Rādhā (that is, Śrī Śyāmasundara), become attainable. That Personality alone is the Absolute Truth. Śrīla Śrīdhara Mahārāja has thus received ubiquitous acclaim for his purport on gāyatrī. Pūjyapāda Mahārāja was so well adept at bhajana that the great majority of eminent sannyāsis, brahmacārīs, gṛhasthas and vānaprasthī devotees of our Gauḍīya Maṭha mission treated him with deferential regard and experienced great joy in discussing matters of the Lord with him. The worshipful nitya-līlā-praviṣṭa tridaṇḍi-gosvāmī Śrīmad Bhakti Prajñāna Keśava Mahārāja and nitya-līlā-praviṣṭa pūjyapāda tridaṇḍi-gosvāmī Śrīmad Bhakti Sāraṅga Gosvāmī Mahārāja both accepted tridaṇḍa-sannyāsa from parama-pūjyapāda Śrīmad Bhakti Rakṣaka Śrīdhara Gosvāmī. During his manifest presence, the world-renowned tridaṇḍi-svāmī Śrīmad Bhaktivedānta Svāmī Mahārāja—who accepted tridaṇḍa-sannyāsa from pūjyapāda Keśava Mahārāja and extensively preached the message of ŚrīCaitanya in the Western countries, establishing many temples worldwide— showed great regard for his senior godbrother pūjyapāda Śrīdhara Mahārāja, recognizing him as an expert in bhajana, and he rejoiced in visiting him to hear kṛṣṇa-kathā whenever he was able. In school, pūjyapāda Śrīdhara Mahārāja simultaneously learned Sanskrit and English under the tutelage of highly learned mentors. Since he was born in a celebrated family of scholars, his natural genius in composing Sanskrit poetry was noted at an early age, and under the shelter of our most worshipful Śrīla Prabhupāda, this innate, God-given ability only blossomed further. Śrīla Prabhupāda, during his manifest presence, would express his immense pleasure to read verses Śrīdhara Mahārāja composed, especially his ŚrīmadBhaktivinoda-viraha-daśakam. By reading several of his poetic Sanskrit compositions—such as Śrī ŚrīPrabhupāda-padma-stavakaḥ, Śrī Dayita-dāsa-praṇati-pañcakam, Śrī Śrī Dayita-dāsa-daśakam and Śrī Śrī Prabhupāda-praṇatiḥ—it is easy to grasp theextent of the staunch, compelling devotion and attachment he nurtured for his śrī gurupāda-padma. Aside from these, he composed Śrīmad Gaura-kiśora-namaskāra-daśakam, Śrīmad Rūpa-pada-rajaḥ-prārthanā-daśakam, Śrīman Nityānanda-dvādaśakam, Śrīla Gadādhara-prārthanā,Ṛk-tātparyam, Śrī Gāyatrī-nirgalitārtham, Śrī Prema-dhāma-deva-stotram and Śrī Gaurasundara-nuti-sūtram, all of which are highly revered through-out the Śrī GauḍīyaVaiṣṇava community. Two of Śrī Śrīla Prabhupāda’s dear associates, the exalted Vaiṣṇava nitya-līlā-praviṣṭa Śrīpāda Kṛṣṇadāsa Bābājī Mahārāja, who was always immersed inthe bliss of bhajana, and tridaṇḍi-gosvāmī Śrīmad Bhakti Vicāra Yāyāvara Mahārāja had a special appreciation for the abovementioned compositions and would sing and relish them with great enthusiasm. In Śrīla Mahārāja’s Śrī-Prema-dhāma-deva-stotram, almost all of Śrīman Mahāprabhu’s pastimes—from ādi to antya, beginning to end—are recorded in brief. Published on its own as a book, with word-for-word purports and translations, this poetic gem of a stotra would prove to be a sizeable devotional literature worthy of regular study. The Vaiṣṇavas also sing with great honor the Bengali songs he composed describing Śrī Gaurasundara’s birth, such as Aruṇa Vasane Sonāra Sūraja, in which he describes Śrī Caitanya-deva as a golden sun wearing a saffron cloth. Under pūjyapāda Mahārāja’s editorial direction, the entire Bhakti-rasāmṛta-sindhu has been translated into Bengali and published with Sanskritverses, commentary, and anvaya (word-for-word translations that follow the sentence structure). Besides this, he has published Śrīmad Bhagavad-Gītā, his Śrī Prapanna-jīvanāmrṭa—a collection of Sanskrit verses regarding śaraṇāgati from various scriptures—as well as several other books, both in Bengali and English. These books have been widely distributed and well-received by Western academics. My name will be propagated in every town and village all over this Earth. The day before Śrī Śrīla Prabhupāda disappeared, he blessed pūjyapāda Śrīdhara Mahārāja with the order of singing Śrīla Narottama dāsa Ṭhākura Mahāśaya’s Śrī Rūpa Mañjarī-pada and various other songs. Pūjyapāda Mahārāja carried that merciful blessing on his head throughout his life and, until the moment he disappeared, dedicated his life to fulfilling the heartfelt ambition of Prabhupāda, the foremost of the followers of Śrī Svarūpa-dāmodara Gosvāmī and Śrīla Rūpa Gosvāmīpāda. Ṭhākura Bhaktivinoda is our exalted predecessor and the foremost of the followers of Śrīla Rūpa Gosvāmīpāda. Our most worshipful Prabhupāda set the magnificent ideal of fulfilling Ṭhākura Bhaktivinoda’s cherished desire. His dearest disciples—pūjyapādas Tīrtha Mahārāja, Gosvāmī Mahārāja, Mādhava Mahārāja, Vana Mahārāja, Yāyāvara Mahārāja, Kṛṣṇadāsa Bābājī Mahārāja, Śrīdhara Mahārāja and other prominent Vaiṣṇava ācāryas—have emulated that ideal and have come to be counted among the followers of Śrīla Prabhupāda, the follower of Śrīla Rūpa Gosvāmīpāda. Now that Śrī Śrīla Prabhupāda and many of his associates have entered the Lord’s eternal pastimes, if the servants of his servants wish to attain his lotus feet, they must be dauntless in cultivating their hope to fulfill the innermost desire of śrī guru. In this task, the dust of the feet of the rūpānugā Vaiṣṇavas, the water that has washed their feet, and the remnants of their food shall be our sole sources of strength and courage. During Śrīla Śrīdhara Mahārāja’s pastime of illness, the manner in which his Eastern and Western disciples preoccupied themselves with serving his sacred form day and night was truly amazing, incredible and exemplary. Following the example of Śrī Śrīla Īśvara Purīpāda’s service to Śrī Śrīla Mādhavendra Purīpāda during his final days, several young Bengali sevakas, especially one boy named Tapana, offered their body, mind and words in the service of their guru in an extraordinary manner, thus becoming recipients of their gurudeva’s boundless merciful blessings. Four days prior to pūjyapāda Mahārāja’s disappearance, on Monday, 8 August, it so happened that I was fortunate enough to be present in Śrī Caitanya Sārasvata Maṭha to have darśana of pūjyapāda Śrīdhara Mahārāja. I stayed there until his disappearance and was blessed to be in his proximity every so often and render some service. The ritual aspect of his samādhi ceremony was performed under my direction. Today, we have lost an intimate associate of our most worshipful Prabhupāda. Remembering the pastime of Ṭhākura Haridāsa’s passing, we have become submerged in an ocean of grief. The void created by his absence can never be filled. It is our grand misfortune that the supremely effulgent suns of the Sārasvata Gauḍīya sky are disappearing one by one, casting that sky under the cover of darkness. Alas! Alas! We are gradually being deprived of guardians and caretakers. I see that the cloud of fallacies and illusion is beginning to cover the sun of pure devotional truths once again. Who will selflessly show me compassion in his absence? Truly, there is no limit to the pain of separation from Kṛṣṇa’s devotees, nor is there any consolation. Who but a devotee of Kṛṣṇa, whose life belongs to Kṛṣṇa, who is a veritable ocean of compassion, and who is fully empathic—he feels the pain of others and suffers when he sees the suffering of others—will strive to deliver the souls who have lost Kṛṣṇa and lead them in His direction by speaking hari-kathā? Who else will selflessly try to dispel the ghost of delusion afflicting such a fallen, miserable soul as I, who am blinded and bewildered? Devotion alone is the supreme function of all souls. As corruptive misconceptions enter devotion, an outbreak of irreligion occurs. It is to dispel this perversion and reinstate the pure principles of religion that Śrī Bhagavān incarnates in every age along with His associates. In the interim, He sends His devotees to preach pure dharma, and thereby manifests His compassion for the living entities. Thus, the supremely compassionate Śrī Gaurahari sent His associates Śrī Śrīla Ṭhākura Bhaktivinoda, Śrī Śrīla Prabhupāda Sarasvatī Gosvāmī Ṭhākura and, more recently, their associates—pūjyapāda Śrīdhara Mahārāja, Mādhava Mahārāja and other such personalities—to effect the establishment of pure religion. Alas! Today, as they gradually disappear from view, we have become totally bereft of our protectors. O Gaurasundara, please protect us! Surely, pūjyapāda Śrīdhara Maharaja has arrived in the presence of paramārādhya Prabhupāda’s worshipful lotus feet and has become engaged in his eternal service. My piteous prayer at his lotus feet is that he cast a glance of mercy from there upon this wretched and destitute individual. Vaiṣṇavas ignore the faults of others. We therefore humbly and pitifully pray at pūjyapāda Śrīdhara Mahārāja’s lotus feet that he may forgive and rectify any offenses, mistakes or oversights we may have committed either knowingly or unknowingly. He has become engaged in the eternal service of Śrī Śrīla Prabhupāda, and so I submit this prayer at his feet: May he mercifully fulfill our lives by granting us the qualification to serve the lotus feet of Prabhupāda and Prabhupāda’s associates. 1 Here, the question may arise as to why Śrīla Prabhupāda referred specificallyto the excrement of hogs, when human excrement seems just as worthless. Because hogs are nourished by consuming human excrement, it is considered to have at least some value. The excrement of hogs, however, it absolutely worthless, because all species of animals avoid it, including hogs. 2 ‘Sarasvatī’ is also the name of the goddess of speech.